Commentary on Kickstarter Update #78: "Then, Now and Tomorrow"
As a Christmas Day present to backers, a new Kickstarter update has been released. 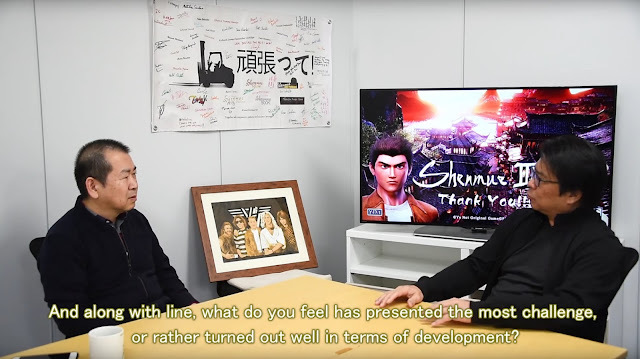 In addition to the animated greeting above (which features Shenhua, Ryo and Chai), the main part of the update takes the form of a video interview with Yu Suzuki reflecting on the past 2.5 years since the announcement as well as looking forward to the year ahead. The interview was conducted by Hiroaki Takeuchi, Shenmue III's Animation Producer who also worked together with Yu as an animation advisor on the original Shenmue. 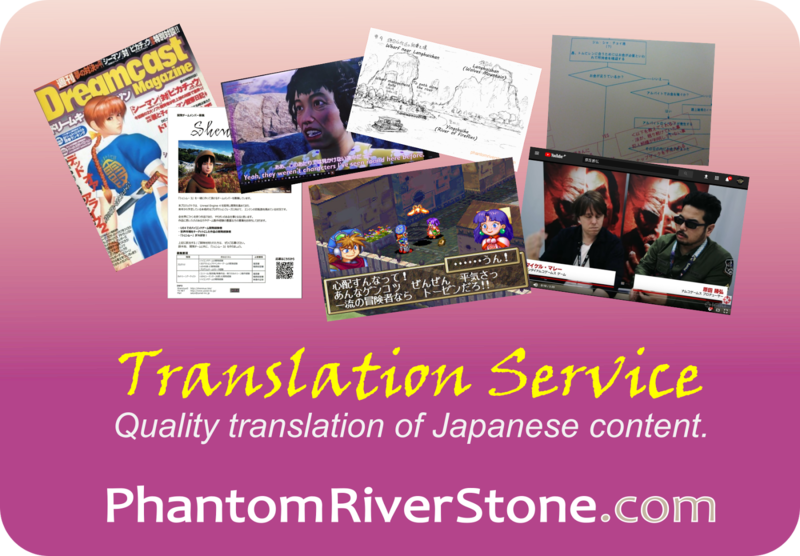 In this post we will highlight some of the main topics Yu mentions, as well as pointing out one or two minor corrections for the English subtitles. As the interview opens, immediately recognizable on display near Yu are two gifts that were presented to him by members of the fan community at Gamescom 2017: propped up next to him is a picture drawn by @r_yuwing of Yu as a member of one of his favorite bands Van Halen and on the wall is a motivational banner created by yuc02 that contains the signature of many fans (as well as the logos of several Shenmue community groups, with this blog having the honor of being among them). 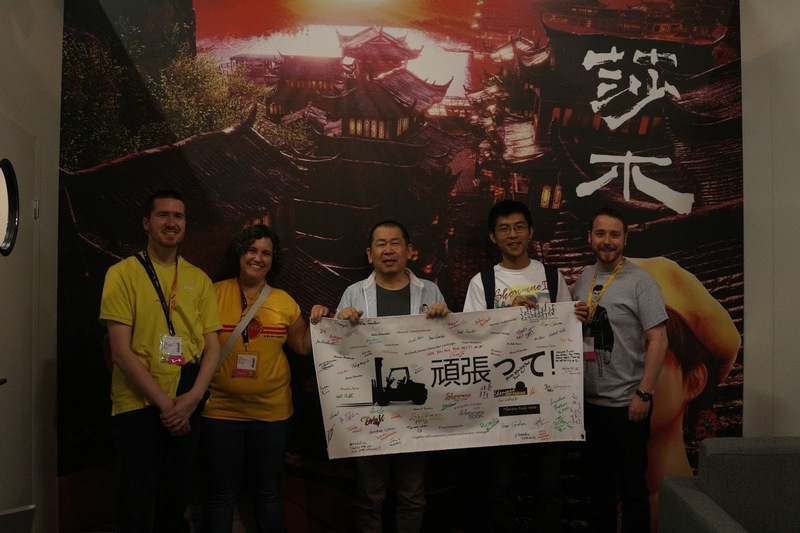 Fan gifts from Gamescom 2017 are displayed next to Yu Suzuki. 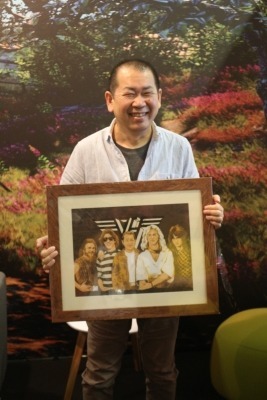 Yu at Gamescom with the Van Halen picture. 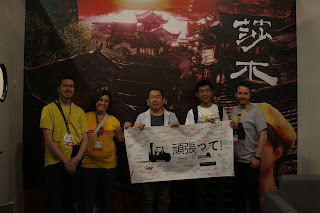 Yu at Gamescom posing with the banner and members of the Shenmue fan community. It is nice to see Yu paying tribute to these gifts by displaying them in the update video. Moving onto the interview itself, Yu talks about how the project has been over the past 2.5 years since the Kickstarter announcement. Echoing a comment he made at Gamescom interviews, he acknowledges that it did take some time to assemble the solid team he now has. He has praise for the ease and efficiencies afforded by Unreal Engine 4, to the extend that the level of graphics have been lifted above what he had been anticipating; on the other hand, he mentions finding a challenge the fact he is unable to tinker with the deepest innards of the engine as he did when developing the original games. Yu states that he is at last happy with the model of Shenhua, although the process of improving it never ends, and that going forwards facial expressions and movements will be added and fine-tuned. Yu is happy with the way the model of Shenhua is turning out. (Note: there is a small subtitle error above: "along with line" should read "along that line"). On the topic of character models, with character design studio Lakshya Digital now having joined the project, Yu states that this month (December 2017) the number of character models has substantially increased. The English subtitles in the video say that the count will "go up to around 100 characters" which could be interpreted as the total number of characters created so far. However, listening closely to Yu's words in Japanese, he is actually stating that the number will increase by approximately 100, on top of the number of characters models prior to that point. Either way, it is good to hear positive progress on the character models from Lakshya Digital. Yu also indicates that the characters will be quite memorable and fun to look at. When asked about what will a topic of focus for him going forward , Yu cites battles as something he wants to express differently compared to the first two games, with various tests already in progress. In today's video interview, Yu again uses the same phrase in Japanese ("thinking-style game") to describe the type of battle system he wants to create. This is a description that applies to games such as board games (chess etc), 3D-block puzzles or puzzle video games like Sokoban. 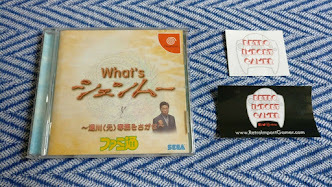 In the English subtitles for the video, it has been translated as "puzzle game". YS: It's a matter of how dramatically, and how cinematically it can entertain the player. I want to make it so that even people who aren't good at fighting games can press buttons - without worrying too much about which, to a certain extent - for the story to advance. While this new direction may be a concern to fans of the Virtua Fighter battle system, it is clear that Yu has a definite vision of the way he sees the new system working. We learn that the casting for the Japanese voice actors is almost complete, with the Japanese voice of Shenhua having been decided just recently, in fact only a couple of days before the filming of the video interview (the original voice of Shenhua has since retired from the industry - as has the original voice of Ren, I believe). On the English side, we are informed that most of the voice actors for the main characters have been cast. The casting for the rest will continue in 2018, as will the start of voice recording. In his wrap-up message, Yu talks about the coming year. 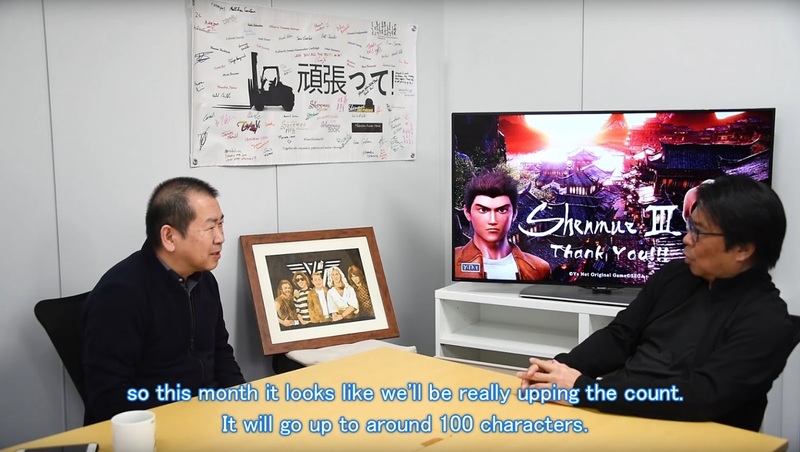 2018 will be a crucial year addressing the most important part of Shenmue: the way in which the Shenmue characters go about their daily lives. 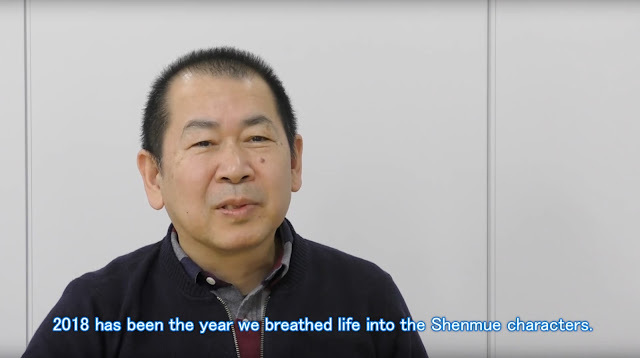 Note: the above subtitle in the video is mistakenly in the past tense; it should read "2018 will be the year we breathe life into the Shenmue characters". Yu's comments regarding his thinking towards certain aspects of the game were consistent with his earlier interviews. 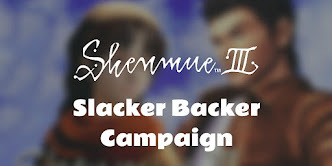 While not many concrete new details were revealed in this update, I believe the main intention here was to maintain communication with backers and outline the direction heading into the New Year, ahead of more substantial updates to follow (an upcoming event of note is MAGIC in February 2018, at which Shenmue III has been confirmed). What did you think of the update? Leave your thoughts below! The full video interview can be viewed below. Thank you so much for this explanation. I'm happy with that situation that Yu is doesn't show so much from the game. 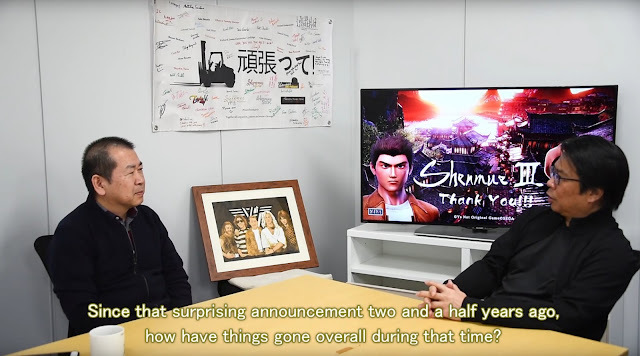 Shenmue III will be not big and everything (characters, story, landscapes, etc.) should be a surprise for us. I looking forward to 2018. Definitely a big year coming up for Shenmue III! I liked the Virtua Fighter style combat. I'd accept something along the lines of Arkham Asylum when it comes to combat but not just glorified QTEs.